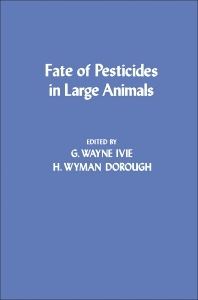 Fate of Pesticides in Large Animals covers the proceedings of the 1976 Fate of Pesticides in Large Animals symposium. The symposium is held at the Centennial Meeting of American Chemical Society and sponsored by the Pesticide Chemistry Division of the ACS. It aims to focus on the fate of pesticides in large animals and to assemble a thesis on the subject covering its theoretical and practical significance. In this book, large animals are particularly considered, because they often metabolize chemicals differently than small laboratory rodents. These differences may prove a basis for the development of concepts pertinent to the phenomenon of selective toxicity. This book is divided into three sections encompassing 14 chapters. The first section delineates the rationale of the symposium and presents topics applicable to all facets of large animal metabolism. The second section focuses on comparative metabolism of selected groups of pesticides, including phenoxy herbicides, insect growth regulators, fungicides, and halogenated hydrocarbons. The third section deals with specific compounds and/or specific large animal species. It includes mirex, chlordane, dieldrin, and polychlorinated biphenyls; p,p'-DDT and p,p'-DDE in pig; phenyl N,N'-dimethylphosphorodiamidate; croneton; and Vacor rodenticide. This book is an invaluable resource for chemists, biochemists, researchers, and toxicologists.